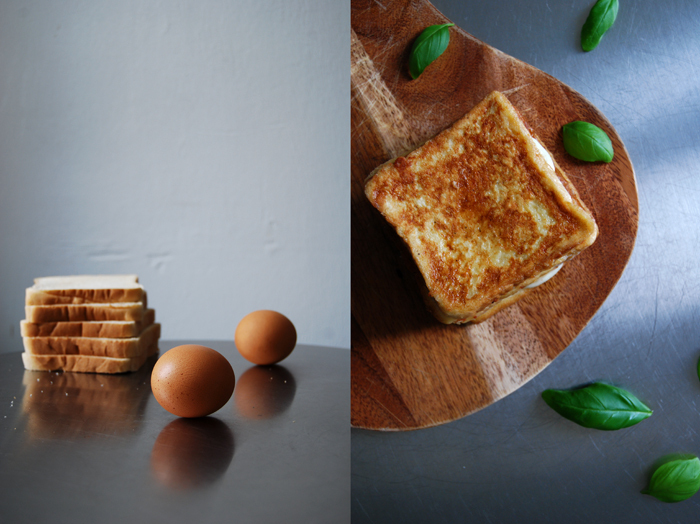 Here’s a savory French toast, filled with mozzarella and basil, or the sweeter sounding Italian name, Mozzarella in Carrozza – meaning mozzarella in a carriage! I’m a big fan of sticky and cinnamony French toast with lots of maple syrup. There were times when I cooked them almost every morning! 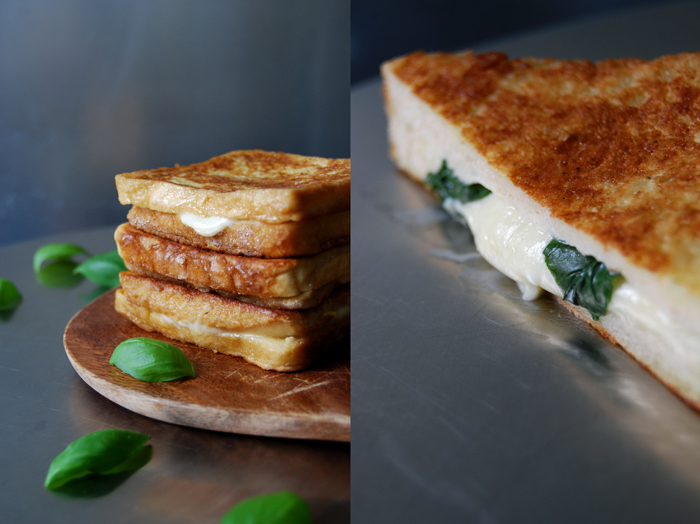 Mozzarella in Carrozza is the perfect savory alternative, with a filling of fresh basil leaves softly melted into creamy mozzarella. Great for a late breakfast, Sunday brunch or as a quick snack! 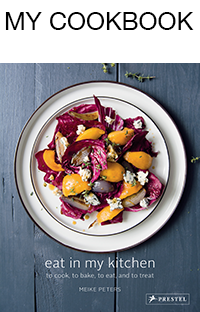 You could also introduce some stronger flavours and replace the summery herb with anchovy or capers, or add some tomato slices or prosciutto. There are endless variations on this recipe, with dried tomatoes, smoked mozzarella, blue cheese, bacon, different fresh and dried herbs… I can even imagine a French version with slices of ripe camembert infusing the warm bread with its strong aroma while it’s cooking in the pan. French toast, it would close the circle again! Mozzarella in Carrozza doesn’t really feel like a normal sandwich, it’s a bit like a pizza – with much less preparation! 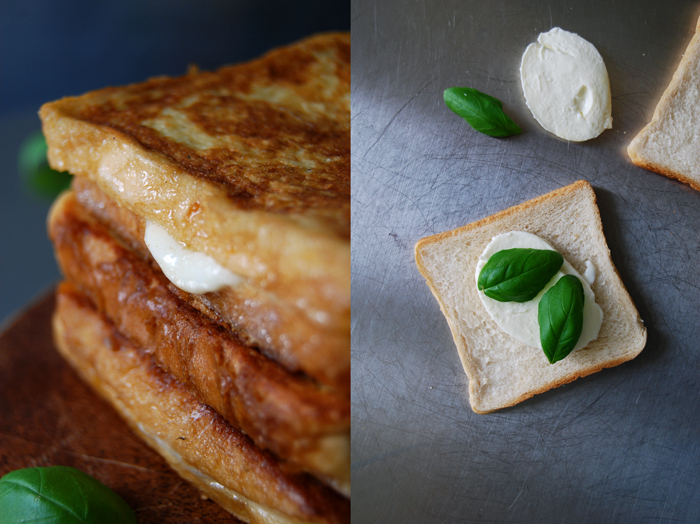 The recipe is quick and easy: You just need to fill the bread with mozzarella and basil leaves, dust both sides of the bread with a thin layer of flour before you dip it in an egg and milk mixture and fry the sandwich in a pan until it’s golden on both sides. Although the bread tastes really good when it’s just out of the pan, still fresh and warm, we enjoyed a couple an hour later just as much! Whisk the milk, eggs, salt and pepper in a bowl. Pour some flour on a plate. 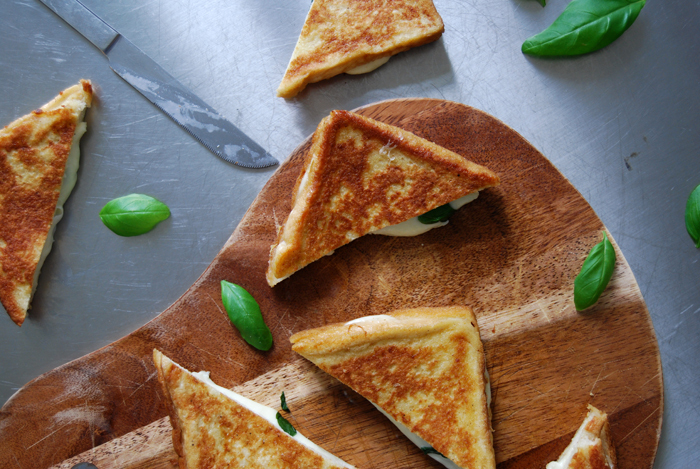 Put 2 slices of mozzarella and 3 slices of basil in between 2 slices of bread, leaving a little margin around the edges. Press the bread together and dip both sides in flour (they should be lightly dusted). Turn the sandwiches in the egg and milk mixture until all the liquid is soaked up. 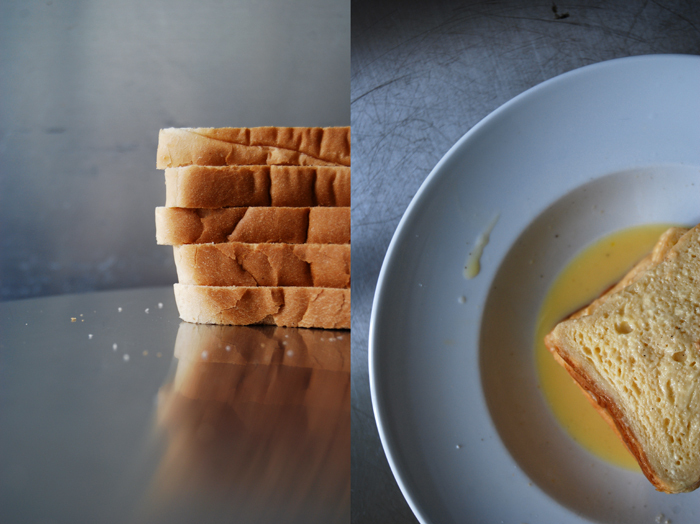 In a non-stick pan, heat a splash of olive oil and the butter and fry the sandwiches on both sides until golden. When you turn them around, gently push them down with a spatula. Take the bread out and cut in half. 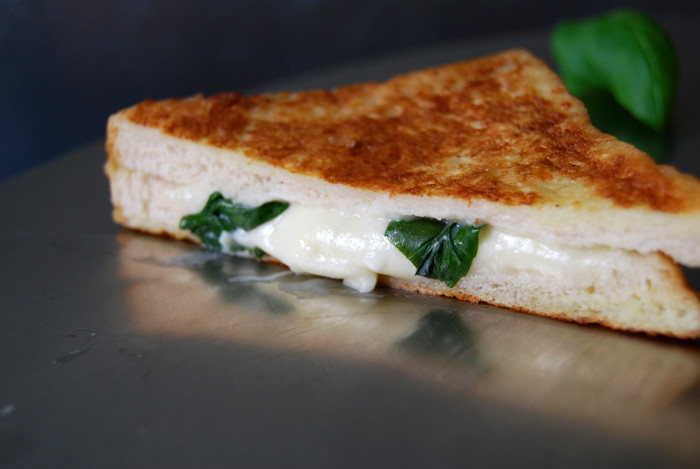 It’s best to enjoy it immediately while the bread is still warm and the cheese is melted. Originally, the bread should be spread with a thin layer of tomato sauce. The whole sandwich egged and crumbed and then deep fried in olive oil.